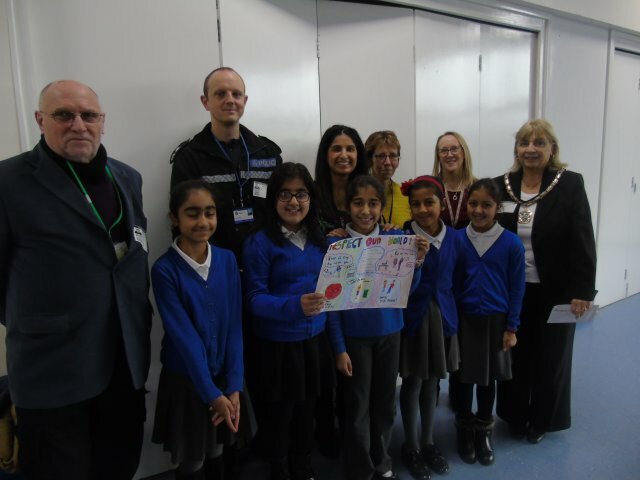 A group of year five pupils at Oadby’s Brookside Primary School were presented (Friday 25 January) with a winning voucher for creating their very own community safety poster. This was part of a competition set by Oadby and Wigston’s Community Safety Partnership who visited the school to look at all the posters designed and talk about safety in the community. Cllr Kevin Loydall said:" I would like to thank Usha Dave of Brookside Primary for inviting our Commuity Safety Partnership team to come along and talk to the pupils about the role of ‘Community Safety’ and how it can make a difference to all our communities. The primary purpose of the Community Safety Partnership is to make the Borough a safer place to live, work, school in, and visit. Everyone has a right to feel safe as they go about their daily lives and this can be achieved by all of us playing our part in tackling issues of crime and disorder. To find out more about the work the partnership undertakes, please click through to their webpage: https://www.oadby-wigston.gov.uk/community_safety_partnership.